Colonoscopy is a screening modality for the early detection of colonic polyps and cancers but is underutilized, particularly among minorities. To identify potential barriers to screening colonoscopy among low income Latino and white non-Latino patients in an urban community health center. We conducted semistructured interviews with a convenience sample of patients 53 to 70 years old, eligible for colorectal cancer screening that spoke English or Spanish. Open-ended questions explored knowledge, beliefs, and experience with or reasons for not having screening colonoscopy. We performed content analysis of transcripts using established qualitative techniques. Of 40 participants recruited, 57% were women, 55% Latino, 20% had private health insurance, and 40% had a prior colonoscopy. Participants described a wide range of barriers categorized into 5 major themes: (1) System barriers including scheduling, financial, transportation, and language difficulties; (2) Fear of pain or complications of colonoscopy and fear of diagnosis (cancer); (3) Lack of desire or motivation, including “laziness” and “procrastination”; (4) Dissuasion by others influencing participants’ decision regarding colonoscopy; and (5) Lack of provider recommendation including not hearing about colonoscopy or not understanding the preparation instructions. Understanding of the range of barriers to colorectal cancer screening can help develop multimodal interventions to increase colonoscopy rates for all patients including low-income Latinos. Interventions including systems improvements and navigator programs could address barriers by assisting patients with scheduling, insurance issues, and transportation and providing interpretation, education, emotional support, and motivational interviewing. The authors would like to thank Elyse Park for help with the qualitative methodology and Sarah Abernathy-Oo and Joan Quinlan for assisting in the early conceptualization of the study and ongoing support. This paper was presented at the 30th Annual Meeting of the Society of General Medicine in April 2007. 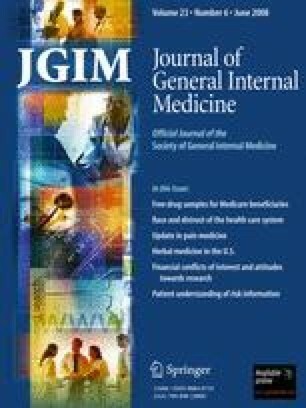 This study was funded by Jane’s Trust and the Clinical Innovation Award: Translating Clinical Insights into Improved Patient Care at the Massachusetts General Hospital.